What can I say? I was staggered by the interest shown in my blog, and many thanks for the comments. 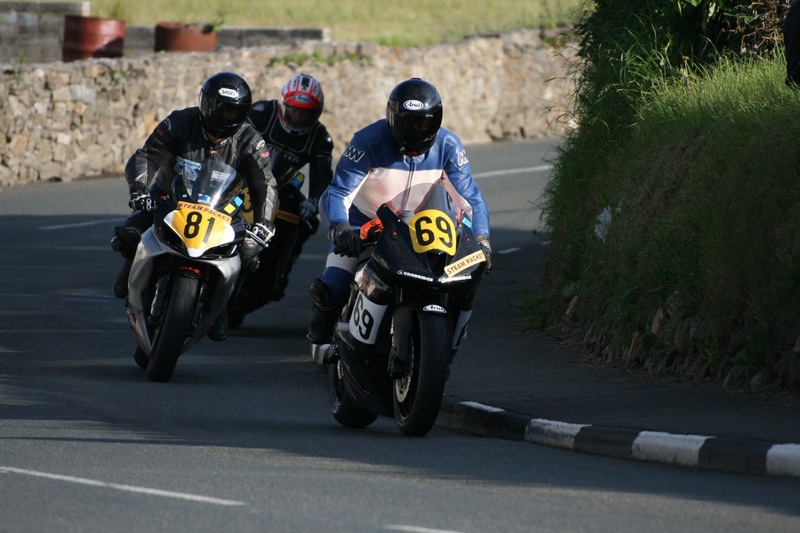 Calky remarked about meeting him at Southern 100 2008. Of course I do. I was waiting to go out in practice so was a bundle of nerves when a chap popped his head up over a wall and said could he ask a question? I was expecting something about tyre pressures, gearing or some other technical question, bearing in mind I was just about to go out for practice so had other things on my mind, when all he asked was where I lived in Andover. Turns out Stuart, and his wife Jill both live in Andover and had come over to watch the racing. They were both surprised to get there and find someone else from Andover racing there. Since then we have become firm friends and have enjoyed many road race meetings. Stuart has also become my unofficial photographer, the one above is me on my ZX6R at this years Southern. Stuart has also put me in touch with a guy selling a van, which I needed and he also keeps an eye out for any bits which may come in handy for me. This year however Stuart and Jill have very kindly bought me two sets of wheel blankets to help keep the heat in when using tyre warmers. So, thank you both very much for this, it was greatly appreciated and will be a great help. What a nice thing to do. I guess we all do do something to help you . I think I need to investigate.